Despite the dominance of color, black-and-white films are not dead. When directors choose to film in black and white these days, they have an objective in mind. Black and white goes hand in hand with the story being told, as the stylistic choice often reflects the film’s narrative and underlying themes. In a time where we have the option, taking the path less traveled opens up windows of opportunities in regards to how a director can visually tell his or her story. If you’re looking for great films to watch this summer, stream these modern black-and-white masterpieces on Netflix. In anticipation of Noah Baumbach and Greta Gerwig’s newest film, “Mistress America,” which hits theaters on August 14, check out the dynamic duo’s debut collaboration, “Frances Ha.” Set in New York City, the film follows the story of a directionless 27-year-old, Frances (Gerwig), who is an aspiring modern dancer. Tackling identity, “Frances Ha” is a staple representation of the hipster culture that put Brooklyn back on the map. Although the plot centers on the struggle to move forward, the film takes a look in the rear view mirror. The shadowy monochrome lighting and the spontaneous and free-flowing camera work are reminiscent of the French New Wave, echoing the style of directors like Francois Truffaut. Baumbach uses black and white because the film is about hitting a crossroads in life. Who hasn’t been in a situation where they don’t know which direction to head? It is a universal theme. Despite the fact each generation faces distinct hurdles, the overall premise, transitioning into adulthood, is as timeless as the medium. “The Avengers” director Joss Whedon revealed that he might also have superpowers when he filmed the indie feature, “Much Ado About Nothing,” in only 12 days. Using his Santa Monica home as the set, he gives the famous Shakespeare play a modern adaptation. What some would consider the original rom-com, the story is full of romance and wit, eavesdropping and scheming, a masquerade ball and a villainous brother. Sounding more like the plot of a series on The CW, Shakespeare’s tale has proven to be timeless and perhaps even more applicable to modern day. Whedon chose to shoot in black and white and set the film in Los Angeles in order to pay homage to the Hollywood screwball comedies of the 1930’s. The narrative’s dizzying pace and quick delivery of witty lines feels right at home in the screwball aesthetic. In the film, black and white references the past, but it is also the cornerstone of the modern look. The glamour of the classic black and white enriches the film and makes the modern world, full of suits and martinis, suitable for Shakespeare. “Tabu,” directed by Portuguese filmmaker Miguel Gomes, is a brilliant and puzzling piece that may require multiple viewings. The film is broken into two parts, set in contemporary Lisbon and in a former African colony. Gomes uses the aesthetic of Hollywood silent cinema and shot the entirety of the film in black and white with a 1.33:1 aspect ratio. He uses the vintage aesthetic to criticize film and reveal how unreliable it is as a mode of historical documentation. The narrative and the aesthetic both reflect and juxtapose one another in order to formally structure Gomes’ take on the complicated issues at play. He has a lot of tricks up his sleeve, including a film within a film, a melodramatic narration and a variety of camera movements, ranging from handheld to static, which distance you from the film world and force you to note the artificiality. Discussing colonialism and race, the film frames the memory of the past within the context of the present. 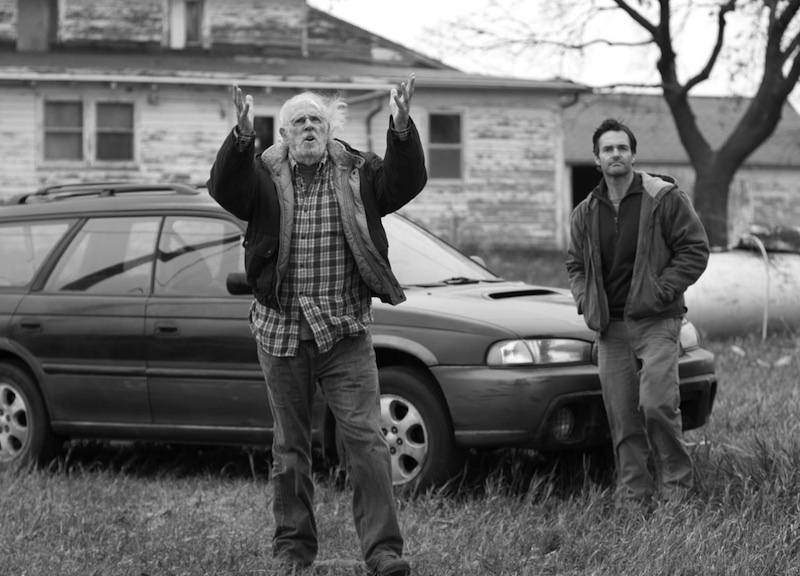 Also featured on our Tearjerkers Now Streaming on Netflix list, Alexander Payne’s “Nebraska” is a film defined by its use of black and white. The Best Picture nominee follows an elderly father, Woody Grant (Bruce Dern), and his son, David (Will Forte), as they road trip form Montana to Nebraska. After relentless attempts by Woody to walk, David caves in and drives his stubborn father to claim a million-dollar sweepstakes marketing prize. The black-and-white visuals are as modest and plain as the lives of the characters. Despite the modern setting, the plot focuses on the past, as Payne makes you feel nostalgic through his aging protagonist and the fading American lifestyle he puts on display. Cinematographer Phedon Papamichael makes the rolling Midwest landscape come to life thanks to his range of extremely long and startlingly close-up shots. The subsequent texture, film grain and contrast that black and white affords allows Payne to do what he does best. Straddling the line between comedy and tragedy, he draws you in to feel the characters’ isolation and the joys of family. A selection from our Netflix Sundance Hits List, “Computer Chess,” directed by Andrew Bujalski, is a black-and-white comedy. The film is set at a 1980’s chess tournament where humans face off against machines for the first time. It’s not an action-packed blockbuster like “Transformers,” nor does it feature a Will Ferrell “Bobby Fisher” cheer, but it is an entertaining film, nonetheless. The black-and-white filming creates a visual flatness that parallels the deadpan atmosphere. Bujalski’s use of vintage Sony tube cameras captures the dull and lackluster aesthetic. In addition to establishing the comedic tone, the film’s style reflects that of the technology on the screen, allowing us to pat ourselves on the back as the history lesson on the evolution of technology reveals the strides society has made. Polish director Pawel Pawlikowski’s “Ida” won the Academy Award for the Best Foreign Language Film. The plot features Anna (Agata Trzebokowska), an 18-year-old girl, on the cusp of becoming a nun. She ends up delaying her vows in order to visit her only living relative, her Aunt Wanda. Anna finds out that her name is actually Ida, that she is Jewish and that her parents were killed during WWII. The unforeseen twist sparks a journey back to Ida’s home village in search of some sort of truth. The film is set in 1962 Poland during Communist rule, and the contents of the plot revolve around the Nazi occupation. Initially, it appears to be a historical look at Poland, yet the broad strokes are merely framework for this impressionistic tale. The black-and-white composition and 1.37:1 aspect ratio are a tribute to the classics. The spectacular visuals and lyrical style, as seen in the static long shots, are used to distance audiences from the plot. It’s not dialogue, but the beautiful black-and-white images generate nostalgia as the aesthetic parallels the remembrance of childhood. Whether or not you are a fan of the recent vampire trend, don’t let the inclusion of bloodsuckers fool you, for “A Girl Walks Home Alone at Night,” the debut feature of British-born Iranian Ana Lily Amirpour, is unlike any vampire tale you’ve ever seen. In a traditional black veil, a young woman (Sheila Vand) roams the streets of the fictional setting, Bad City. Considered a feminist film, Amirpour defies conventional social interactions as the female vampire preys on men who target women. The stunning cinematography and black-and-white footage flourish against the backdrop of pop culture references. A parody of both spaghetti Westerns and the James Dean attitude, Amirpour’s poetic visuals stand alone in dismantling the repressive elements of mainstream Western culture. “Pi” is Darren Aronofsky’s debut feature. The acclaimed director of “Requiem for a Dream” and “Black Swan” established his reputation as a master of psychological thrillers with the 1998 film, which investigates the genius of its complicated protagonist, Maximilian Cohen (Sean Gullette). He is a paranoid mathematician who believes everything in the world can be explained by numbers and patterns. The story follows his attempts to figure out stock market trends, and inevitably ends in his loss of sanity. The black-and-white filming and incredibly fast editing takes you into the mathematician’s head. The style is discomforting and transcends paranoia as the speed of transitions mimics the darting eyes and thought process of the mathematician searching for patterns. Christopher Nolan is another household name whose first feature film was shot in black and white. “Following” is the story of an aspiring writer, Bill (James Theobald), who is questioned by an elderly man (John Nolan) on his peculiar habits of shadowing random people to see where they are going and what they will do. The main character eventually runs into trouble as he crosses paths with a stranger who steals memories. Not to fear, Nolan establishes his personal style, full of plot twists, parallel action crosscuts and the shuffling of chronological order. The hand-held camera work and the grainy black and white resemble a documentary. It’s easy to relate to the film because of the style’s familiar qualities. It will undoubtedly make you question if anyone is watching you the next time you’re in a crowd.